← 56049 a little step closer to a return to traffic? 56049 finally made its return to mainline freight work yesterday, working the 6E32 08.55 Preston Docks (Ribble Rail) – Lindsey Oil Refinery empty Bitumen tanks. 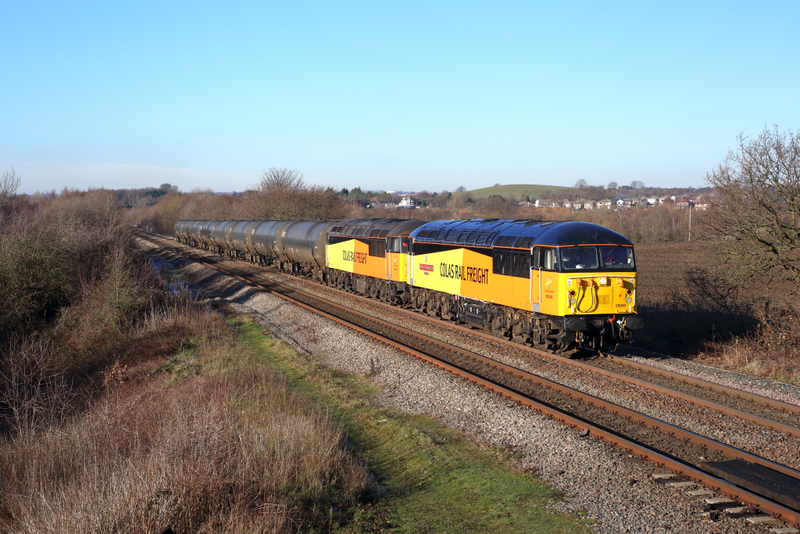 Colas Rail’s previous mainline returnee 56090 had handled the outward trip in a reverse view of the formation seen above. This was 049’s first outing on a revenue earning freight train in the UK since January 2004, having been removed from use by EWS on 1st February of that year at Immingham, being stored to the WNTR ‘tactical reserve’ pool. The loco was later selected for export and use with French operator Fertis Rail, so was reallocated to the WZGF pool and (following attention at Bristol Barton Hill) moved to France in May 2005. It arrived back in the UK during November 2006, spending another five and a half years in storage at Old Oak Common and then Crewe Diesel Depot before being sold to European Metal Recycling (EMR) at Kingsbury in April 2012. It was finally given a stay of execution a few years later, when it was purchased by Colas Rail and moved to their premises at Washwood Heath where work to reinstate the loco started in earnest. Following the closure of this site to make way for HS2 foundation works, it was then relocated to its most recent home at Boden Rail, Nottingham Eastcroft from where its overhaul was completed. It is the ninth and penultimate class 56 to return to front line service for Colas Rail, with just 051 (for now) waiting in the wings at Nottingham Eastcroft. 049 & 090 ventured out again this morning, working the 0E32 03.40 Barnetby Sidings – Wakefield Kirkgate & 0E33 05.47 return. These were traction training runs for new drivers.